New Products from Midland Towbars! Arriving Soon: new accessories to suit your towbars! Have you ever been frustrated trying to fit a tow ball and the ball just keeps spinning when trying to tighten the nut? Well, now this problem is solved when you have our new locking sleeve! Suitable for most towbars. 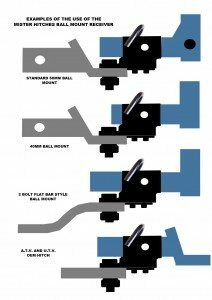 [requires a flat sided towball, a suitable wrench and our new Mister Hitches Tow Ball locking sleeve]. 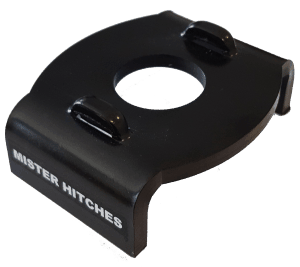 The Ball Mount Receiver Adaptor allows you to fit a 50mm square receiver to almost any hitch where there is a tow ball hole. Now you can fit your receiver mounted accessories [eg: your Bike Carrier] to your existing towbar; even if your towbars have a 40mm square receiver or just a flat plate. The team at Mister Hitches have done it again. 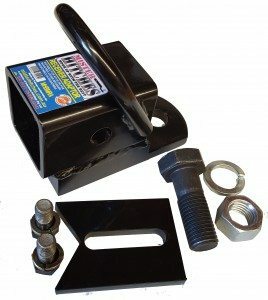 They have come up with a solution to your towing hitch problem. 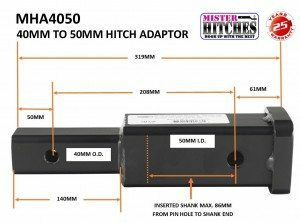 This 40mm to 50mm Receiver Adapter allows you to convert your 40mm hitch towbars to a standard 50mm receiver towbar. Now you can use your 50mm receiver mounted accessories [eg: your bike carrier]. NB: Not to be used for towing purposes. Did you know that we now do “window tinting”? Give us a call and lets have a chat about what you need to “dress up your new vehicle”!